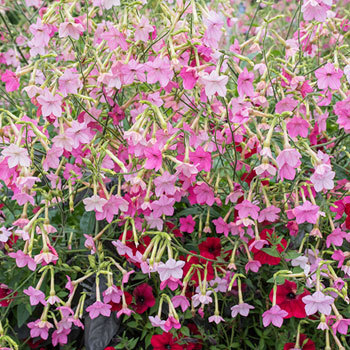 Dripping with cascades of tubular blooms in saturated to soft hues of pink, this hybrid Nicotiana is a scentsational addition to cottage gardens of mixed summer annuals, a standout paired with silky pony-tail grass at the front of the border. Generous bloomers, flowering tobacco’s long tubular scented flowers add contrasting form to the many rounded flower shapes of summer. It is right at home in cottage gardens at the mid border. Deadhead for continual bloom. Plant: A cluster of large ovate leaves will form at the base of the plant, with a slender flower stem reaching about 3-3.5’ in height. Stems are also leaved, with the light green foliage decreasing in size moving up the stem. Seeds: The seed is very tiny, less than the size of a pin-head, and is produced inside of a two- or four-valved capsule. The capsule will split open and spill the seeds if not collected. This flower typically opens in the late afternoon-evening, emanating a divine scent to be enjoyed by anyone sitting nearby at dusk. It for this reason that Nicotiana was often intentionally planted outside of parlor windows in the late 1800s or along walkways in Victorian times.